Hoh Aeronautics, Inc. developed the Aeronautical Design Standard Performance Specification for Handling Qualities Requirements for Military Rotorcraft – ADS-33E-PRF. This work was accomplished through contracts with the U.S. Army's Aeroflightdynamics Directorate (AFDD) at the NASA Ames Research Center, California. HAI also wrote the Test Guide for ADS-33E-PRF under this contract (Special Report AMR-AF-08-07). Unfortunately, the official version of this test guide is too large to link to this website (77 mb). Requests for further information regarding ADS-33E-PRF the supporting Background Information and User Guide, and the more recent Test Guide should be directed to Mr. Chris Blanken at the Aeroflightdynamics directorate (AFDD), located at the NASA Ames Research Center in Mountain View California. The development of ADS-33E involved a considerable amount of research to develop updated handling qualities criteria for helicopters. The following concepts, created by Roger Hoh during this work, are now well accepted by the helicopter community in the U.S. and throughout the western world. · Bandwidth as a criterion – this criterion works for all types of helicopter flight control systems. Bandwidth is a measure of how well the rotorcraft response can follow pilot commands at the maximum pilot gain that does not threaten stability. · Mission Task Elements (MTE) as a way to break down mission maneuvers into elements that can be easily tested. · Useable Cue Environment (UCE) as a methodology to quantify the tradeoff between degradations in the visual environment and required level of augmentation. The original work to develop the UCE concept was accomplished by Mr. Hoh while employed by Systems Technology Inc., shortly before founding Hoh Aeronautics, Inc. 1988. The AHS paper summarizing that work is provide here as a link – Flight Investigation of the Tradeoff Between Augmentation and Displays for NOE Flight in Low Visibility. · Response-Types as a methodology to quantify and generalize the response to control inputs for highly augmented helicopters. 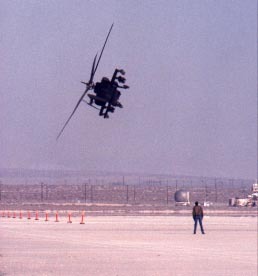 Figure 1 is a photograph of a Blackhawk accomplishing the Slalom MTE during specification development at Edwards AFB. 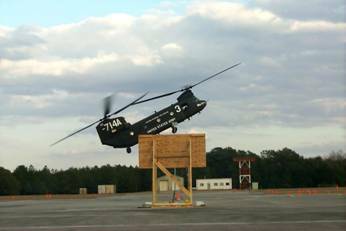 The photograph in Figure 2 is a CH-47D accomplishing the Acceleration and Deceleration MTE at Ft. Rucker, AL. AFDD engineers and army pilots from Ft. Rucker have continued to refine the MTEs during recent years. The tradeoff between degraded visibility and stabilization that was quantified by the UCE/Response-Type methodology in ADS-33E for military MTEs, intuitively applies equally to civil helicopter operations. In that context, HAI was tasked to accomplish an exploratory study to investigate potential revisions to the FAA requirements for rotorcraft IFR. A VMS simulation was accomplished by HAI, which verified that the current FAA requirements are ineffective, and that a revision would be highly desirable. For example, pilot workload was found to be unaffected by passing or failing the requirement for a negative gradient of cyclic force vs. airspeed. As expected, attitude stabilization was found to be the only way to achieve an acceptable level of workload short of a full autopilot. Unfortunately, the rotorcraft budget was set to zero, and this work was never completed. The decrease in pilot workload with attitude stabilization was further quantified by an analysis that is given in a technical paper presented by HAI to the American Helicopter Society Helicopter Specialist meeting in Gifu, Japan. – ACAH Augmentation as a Means to Alleviate Spatial Disorientation for Low Speed and Hover in Helicopters. HAI has been, and is currently working with the U.S. Navy (Navair) to develop maritime MTEs specific to operations in the shipboard environment. In that connection, HAI recently delivered an electronic hover display to Navair at Patuxent River, MD. This display provides a moving hover target that represents the same handling qualities as would be required for shipboard landings in varying sea states and classes of ship. The moving hover-target concept was developed by the National Research Council (NRC) and a mechanical version was dubbed the Super Slide. HAI is currently developing a user friendly interactive computer program to assist engineers to comply with the requirements of ADS-33E-PRF – “ADS-33 Specification Application Package” (ASAP). This work is being accomplished under contract to Navair and a beta version of ASAP will be available by the end of 2011. ADS-33-E-PRF was designed by HAI to be a tailored specification to provide unique requirements depending on the rotorcraft mission objectives and operating environment. Given the mission specifications, it is possible to define the applicable MTEs and to quantify the visual environment in terms of UCE. The user inputs the MTEs and visual conditions (UCE) that are required to accomplish the mission. Given this information, ASAP provides a list of requirements, guidance, and algorithms to assist in demonstration of compliance with ADS-33E-PRF. As part of this process, ASAP specifies the necessary Response-Type. It is then up to the user to define a flight control system that meets the requirements for that Response-Type. ASAP will also contain the guidance that we provided in the development of the ADS-33E Test Guide (AMR-AF-08-07). HAI conducted a series of simulations on the Vertical Motion Simulator at NASA Ames to investigate handling qualities criteria for helicopters with an externally slung load. A technical paper that reports the result of those simulations can be seen via the following link – Development of Handling Qualities Criteria for Rotorcraft With Externally Slung Loads. One of the major findings during the development of ADS-33E-PRF was that attitude-command-attitude-hold (ACAH) stabilization greatly reduced the workload for operations in degraded visual environments. An example is flight with night vision goggles on a moonless night. Most existing army rotorcraft only had limited authority flight control systems that provided rate stabilization, and an upgrade to ACAH was clearly desirable. HAI was tasked to look into the feasibility of modifying current limited authority flight control systems from Rate to ACAH Response-Types. HAI conducted simulation experiments at Ames Research Center on the vertical motion simulator (VMS) and flight research on Canada's National Research Council (NRC) variable stability Bell 205. The results of that work are summarized in a technical paper – Evaluation of Limited Authority Attitude Command Architectures for Rotorcraft. This work led to the development of HeliSASTM, a lightweight, low-cost stability augmentation system and autopilot for light civil helicopters. This is discussed in detail in the noted link. HAI also utilized the limited authority concepts developed above to propose an upgraded flight control system for the CH-47F. As a result of two VMS simulations, it was decided to incorporate the limited authority concepts in the general upgrade from the Boeing CH-47D to CH-47F. The control laws developed by HAI were refined by Boeing during system integration and the resulting digital automatic flight control system (DAFCS) is successfully flying on CH-47F helicopters.